Welcome! This cloudy, rain pending morning I have changed two poopy naps followed by eventually lighting the fire and polishing off a coffee. These days I find it tricky with Thomas not napping during the day. He dropped his day naps shortly after turning 2 many moons ago. I find this surprising considering he has had significant brain damage. (Grade III brain bleed) I had it in my head that he would require naps to re-fire his brain from over-stimulation or ‘neuro-fatigue’. It has been the opposite for us. Thomas requires lots more stimulation whether it be auditory, kinaesthetic or oral. Yes, he still loves to bring things to his mouth! Lots of nerve endings getting some TLC! Personally, I don’t mind this because it encourages him to use his arms and hands more which is great physical therapy in itself. For a long time there, Thomas wasn’t able to get his hands near his face and so it is exciting that he is starting to get better at moving his hands towards his face. This encourages him to explore his face too. During the day Thomas will enjoy listening to nursery rhymes or stories on his iPad. We have to encourage different positioning throughout the day so he will either spend time on the floor, in his gravity chair, wheelchair or standing frame. 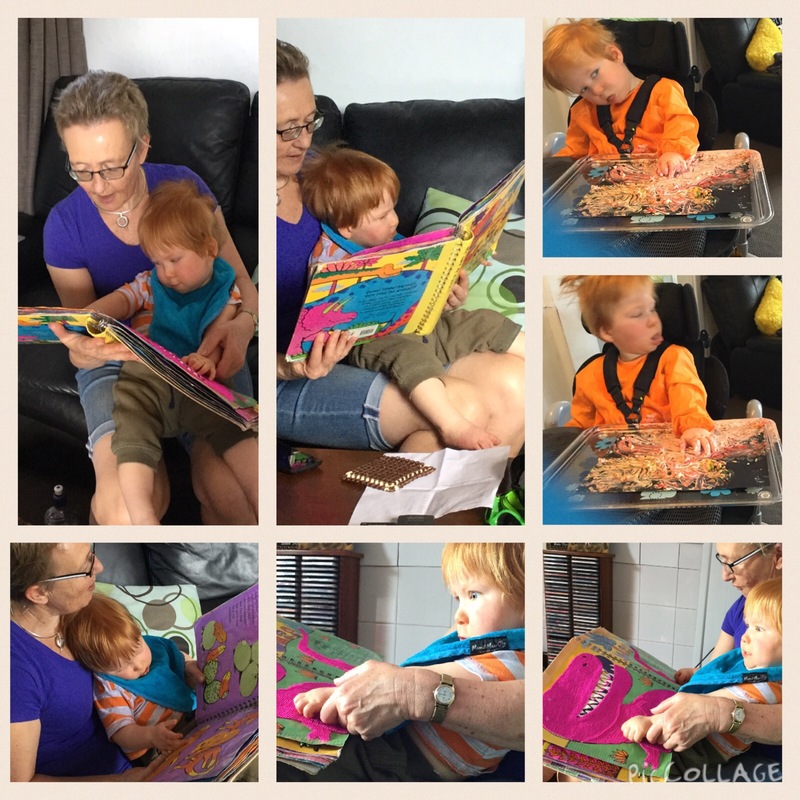 He attends kindy three times a week, 2.5 hours a day. This is as much funding that the MOE (Ministry of Education) will give us even though I have stated I want him to attend more. Getting a third session required getting more people involved to make it happen. So although there is such a thing as 20 hours Free ECE, Thomas does not get anywhere near this amount because he requires a support worker (Teacher Aide) additional to this with him at all times and this is the funding that the MOE is not willing to provide on a needs based situation. So this means that we cannot take advantage of the full 20 hours. I am beyond frustrated with this. Is this discrimination you wonder? Yes, it is. Is this happening to other children around NZ? Yes, it is. Thomas also attends weekly hydrotherapy swimming lessons in Whangarei. This is the highlight every week for him. He continues to improve his swimming skills each time we attend. Thomas is a member of the Cerebral Palsy Society and they provide vouchers for physical therapy. This is what we use our vouchers for. Thomas is wearing his fantastic new flotation device from Water Gear. It is the safest device that we have come across with the most even distribution of foam support. Using a life jacket, we found that it was safe but too much foam was situated around the trunk area that made it difficult for him to remain vertical in the water. The waterway babies neck ring was great up until last year. We found that as Thomas became more and more physical, he would dunk his head in the water taking in the water. This became a safety concern so we went hunting for a more appropriate flotation device which resulted in the above. Good golly! Big absence for me however the Facebook page remains active. I find it easier to post quick bits and bobs. Uploading video is quicker these days on Facebook too! I have been meaning, truly! to return to writing. We all get caught up in the busy of it all don’t we? For the last year and a bit since moving away from Auckland I have really thrown myself into a whole lot of different focuses with Thomas. Hydrotherapy, wheelchairs, mobility van, moving again, Second Skin, more seizures 😥, kindy and soon to be school!!!!!! I’ve been focusing on myself a little more too. Here is a recent pic of Thomas. This is a post dedicated to the use of the Big Mack and the different ways we scaffolded its use. The best way to show thisis through video which have been uploaded, hopefully in the right order! Thomas is currently now using two Big Macks this past week to differentiate whether he wants ‘more’ or ‘no more’ whether it be water or food he is being offered. I have noticed that when I wipe his face after a feed he immediately hits the ‘no more’ button in protest because he doesn’t like his face being wiped! Cheeky monkey! We have also been using the yellow Big Mack to say ‘yes’ and the red to say ‘no’ when offering him toys. We have noticed that if he accidentally hits the ‘no’ button when he gives the gestures of ‘yes’, he quickly hits the ‘yes’ button and this we take to be a genuine yes. We alternate moving the different coloured Big Macks left or right to encourage him to use both arms/hands. From this you will see that Thomas has improved in strength in using both, especially his right side which is tighter. Thomas has also used the Big Mack to say a repetitive sentence in a book whereby I wait for him to press it with a simple prompt like ‘and’. This showed us that he can follow instructions and know when to press the button with timing. Very smart boy! We are hoping to get TalkLink on board soon to explore communicative devices. We have been waiting over a year now for this. They will hopefully help give us more ideas of devices and tools we can use. It has been very exciting to see Thomas using the Big Mack so purposefully. He continues to surprise me. Such a clever boy! I remember and I also don’t remember much from when we were first told that our son had suffered a bleed in the brain. I reflect on it often when thinking about where Thomas is now from his very first beginnings that started with the brain hemorrhage. I was home alone, in Thomas’ bedroom when I took the call. My husband was at work. I called him immediately. After I called him, I cried. I remember being in shock. Holding back tears. Confusion. I prepared for the reality that Thomas would die, or remain in a severe comatose like state. The specialists were thrown into fairly unknown territory needing to call on Starship for advise. Thomas was only 10 days old when I was first introduced to epilepsy when seizures became as regular as every few minutes. I learnt how to do CARES (temperature check, nappy change, wipe nose, mouth and eyes) through the incubator holes. The sounds of the many different monitors. All of which terrified me. I watched my son, motionless. Intubated because the medications slowed his breathing. Pumping milk became a regular slot in the day that led to me storing unused milk because Thomas was no longer tolerating feeds. I remember feeling a mix of hope and a sense of loss as to whether the milk would ever be needed again. Nurses became friends. Friends kept a distance. Doctors rounds were a regular event each day, not to be missed. I visited Google regularly in desperation for information on anything related to brain injuries, specifically a Grade iii hemorrhage. Not much, it turned out at the time. I remember seeing quite a few babies come and go through the NICU and thinking, will we be able to leave with our son one day? When Thomas started to move a limb and open his eyes. I remember these moments too. I felt like I was witnessing a real miracle. That the seizure medications worked and the seizures ceased. Thomas was very drowsy for quite some time and he would need time to heal and adjust. That from now on, he was experiencing his world, post injury, for the first time. Celebrating that he could pee again. Tolerate feeds. Move out of the intensive unit. Able to regulate his temperature. Learn to breastfeed. I remember thinking how amazing it is that he would wake and cry. That he could communicate by crying. After so much silence, it was lovely to hear him cry! Thomas came home after 7 weeks in the NICU. He was born 6 weeks early. We were told he would come home on a feeding tube. Instead, he came home fully breastfed and this continued up until 13 months old. We were told that Thomas might have cerebral palsy and this I had accepted. I was just so thankful that he was still with us. Thomas is nearing 3 years old and gearing up for kindergarten. Thomas has come a long way since then. He has had a lot of challenges, which still continue every day. But, he is a mostly happy boy who gives and receives love. He is able to communicate in his own way the basic needs like being tired, hungry, thirsty, bored, scared, happy, angry and excited. He smiles, giggles and gives kisses. He comprehends words and follows instructions. He finds ways to move around on his back using his legs and feet. He has a cheeky personality and he loves attention. He loves music and playing. If there is one thing that every parent/caregiver/family member/friend should know about brain injuries in babies is that every brain injury is different regardless of the grade (1-4) and it’s resulting prognosis. It takes time, a lot of time. Time to grieve, to find one’s way through acceptance and that the grieving cycle runs on repeat every time there is a new diagnosis, event or trigger. It can be very lonely at times simply because it is not a common event and when it does happen, you realize that you may or may not know anything about it or anyone who can walk/talk you through it. Again, there is no way to know how things will unfold. We were told again and again to ‘wait and see’. That was pretty much it, besides having Home Care nurses on board, a developmental therapist and to expect seizures. Having a really understanding GP helped get us fast tracked through certain scenarios. There are plenty of Facebook support groups that are private. There are a lot of blogs out there too. Just find the ones that you can relate to. Being a mother to a child who is the true definition of a miracle is rewarding. I love my son so much it hurts. I never ever stop thinking about him. I worry all day, every day. I worry that he is in pain. I worry that he is having seizures that I cannot detect, yet. I worry that he is thirsty. I worry that he is hungry. I worry that he needs more stimulation. I worry that he is over stimulated. I worry that he feels scared. I worry that he wants less or more time with me. I worry that I didn’t do enough stretches with him that day. I worry that he has a headache. I worry about how many calories he has had that day. I worry that he is uncomfortable and needs to be moved into a different position. Worry, worry, worry. I have spent a lot of time worrying for over 2 and 1/2 years and I know that it will never stop. I worry for the future every day. Equipment, medications, transition into kindy and school, birthdays, surgeries, countless appointments, possible hospitalisations. It never stops. I spend so much time worrying about my son that I forget about me. I forgot about ‘me’ once Thomas was born. This, I am sure, is similar for most parents. I forgot to look after myself. For the first year or more I was isolated. I had moved away from our town, my job that I adored, and friends. I had family visit every now and then when they could. The husband at work. But mostly, it was Thomas and I. I don’t know how I got through it for so long, so alone. Respite has been a wonderful thing, but by the time that commenced, I was already living in a cave on my own. Inside my head, lost. How did I get so lost? I know my fellow mummies like me will completely understand this. How you can be surrounded by a group of people but yet feel so alone. Like you feel out of place, not fitting in. But longing to fit in. Longing to relate to others. Wanting to worry less. Wanting to feel like you still have an identity, as a person. Not just a stay at home mum. But a person who, every now and then, would like to feel included, invited, considered for who they are. Not just a mother. A former work colleague, friend, Aunty, daughter, or sister. What ever it may be that applies to you. I find myself often reflecting on the last 2 years and thinking about who I was before it all unfolded and who I am now. My identity has dramatically altered in ways I never thought possible. It sounds like a cliché but it is the truth about my whole being as it exists today. Recognising who I am now has been a gradual journey of rediscovery that has been quite brutal at times. It feels like I have been slowly emerging from the dust that refuses to settle. I constantly remind myself that I am not alone although there are those periods, days, weeks, and moments where I am so lost I can’t even find myself amidst the chaos. I remind myself that Thomas is at the core of everything. He is my reason to push on when I feel so empty, so broken. I look to my husband and see a lot of strength that is solid and at times unflinching. I look to this and hold my own when I feel I am losing myself. When I lose myself, it is often so much like the temper of a toddler. Unpredictable. Random triggers. Walking on eggshells. Stormy. Sometimes brief, or otherwise ongoing. I remind myself of my family, my husbands family and how they have felt during our journey. Have they received the support they needed when processing difficult news? Often times, as the parent, receiving the traumatic news is difficult in itself, but to then find a way to deliver it is not easy. It’s like a second blow. Now, 2 years later I am the same person but it’s just that I’ve been through a crash course within the complex/high needs community that has left me strong, but with many wounds. Those wounds that I have are still very raw and tender however as time goes on, I am learning how to carry and care for my wounds. I believe that I could improve on the TLC front of looking after me. I have realised that you cannot pour from an empty cup and it has been a huge wake up call for me to recognise and identify how I can look after myself. This is very much a work in progress for me. These last few months have been an especially busy time with moving out of Auckland, closer up North. Thomas is now 2 and services are changing and I now find his team expanding with even more appointments and as he grows equipment continues to be a constant focus. We have taken on a business and I am needing more support and we have now another carer to help address this. So glad that someone found the right words for this topic. I have always felt unsure about how and what I share about my son. Every journey is indeed unique and different. On that note, our journeys share similarities too and to be able to find just one parent going through something similar is finding the light amongst the dark. There’s a battle going on in the special needs community. I first became aware of it when I followed a link a mother had posted on facebook to Lauren Swick’s article in the Washington Post. In the article, entitled Writing for the Mighty, for my son and with my son, she talks about the debate happening in this particular part of the community. The Mighty is a sight whose motto is “Real People. Real Stories. We face disability, disease and mental illness together.” It’s a fairly new site and its articles range from contributions from parents of special needs kids, to people suffering from mental illness, to anyone with a story to tell that might shed light on what it’s like to live this life. I myself have contributed a number of stories to The Mighty. Wishing you all a very Merry Christmas from Thomas, mum and dad. 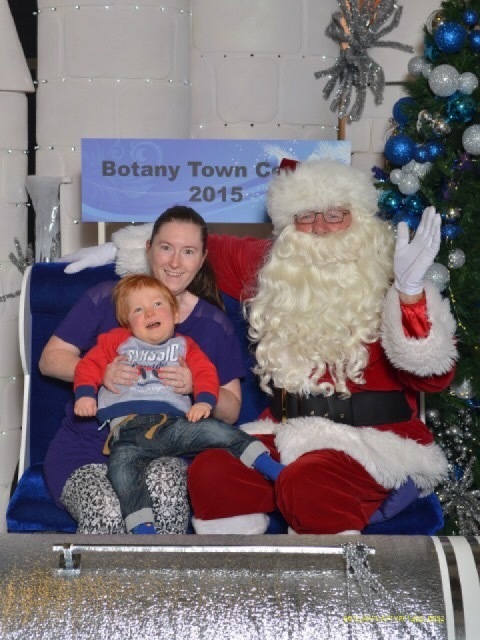 This photo is the happy result from our first Sensory Santa photo session. It meant booking in and taking an early morning trip to East Auckland. This meant no waiting in lines or loud noises. It was as we hoped it would be, which was as little stress for Thomas as possible. He was not comfortable on Santa’s lap so I stepped in and that is why you can see Thomas’ leg resting on Santa. Thomas also managed to tug on Santa’s beard which I thought was funny! Things have been very busy in and outside of our household lately. We have been busy preparing for a new venture which will take us to a new home in Warkworth. This move is happening next week! More on this once we are all settled into our home. Many thanks to everyone for following the blog and Facebook page. It may be easier for me to post quick updates on Facebook until things quieten a little. In the last month I have noticed some positive changes with Thomas that I would like to celebrate with you all. Thomas is now content to sit in my lap and listen to a story. Anyone who knows me personally knows that I love reading! I am so thankful that Thomas is able to participate in this experience. He used to get upset and start to cry and most times would get anxious about touching the book. He is showing a curiosity to touch the pages. These books we are so lucky to loan from the BLENNZ library. Thomas is using his eyes more to look. If you are in his presence, it is all about knowing his preferred visual field. His preferred visual field where he sees best is his left peripheral visual field within 10-15 centimetres. I still offer him objects to both, but if I want him to look at me, I will put myself in the appropriate position and he will repeatedly look at me, look away, look back again. He will not give eye contact but he does look at me for 1-2 seconds. He has done this with other people like family members and visiting therapists. When sitting with Thomas to play on the floor he is content to sit with me for a lengthy period to cuddle, read, play with different toys, sing and rock about. He will often try to turn around to look at me. He is making many attempts to echo my sounds. Words he prefers to say are hello, mum, love you and more. Today, he mostly said hello. He loves to say hello. He’s trying to copy my tone, whether it might be a loud sound or the same sound but gently uttered. Sometimes it’s single vowels like ‘a’ and ‘o’ but he draws them out like he’s yelling it! The IPad continues to be a wonderful tool. Thomas will remain quite focused and engaged when in the right mood of course. 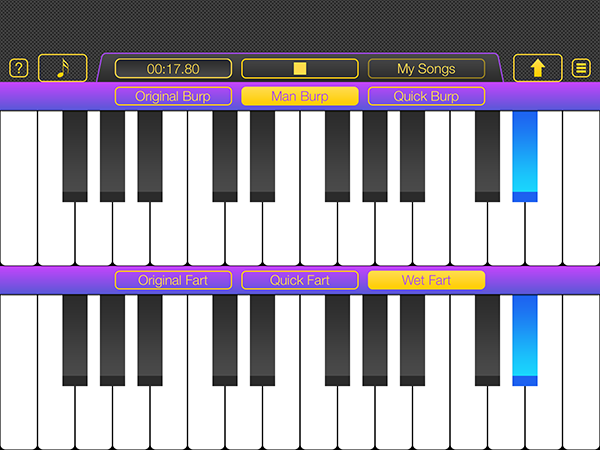 He is really into a new piano app called Burp and Fart Piano. He thinks it’s hilarious! I have found a way to encourage Thomas to paint. By using rice, wheat or textured cardboard, he is willing to give it a go. He has the most determined face when he paints! Thomas has overcome his phobia of the Velcro sound. He would scream, cry and melt down when he heard this sound and quite often due to it being a necessary part of all his pieces of equipment I.e. Standing frame, bath chair and AFO’s. How has he overcome it? It is also a part of his safe t sleep system which when we take it off, he has now associated the sound as a positive reinforcement for getting out of bed. We also say ‘ready’ and he knows that a sound is coming. Fantastic! Thank you for writing this, I could so relate. Especially about the PTSD, comfort eating, depression and talking the ear off a friend or family member. Perfectly put about not getting adult interaction when you are mostly at home or at medical appointments! Please click this link every time you visit to help with my ranking on that site!